In 2014, Point Park alumnus Richard Moody won the Human Service Road Runner Award from Visions Towards Peace Counseling Services LLC. He also won the Blazing Emerging Leader Award from the Pittsburgh African-American Leadership Association and received a proclamation from the Pittsburgh City Council in 2012. How did you become clinical supervisor of the outpatient forensic service unit at Pittsburgh Mercy? 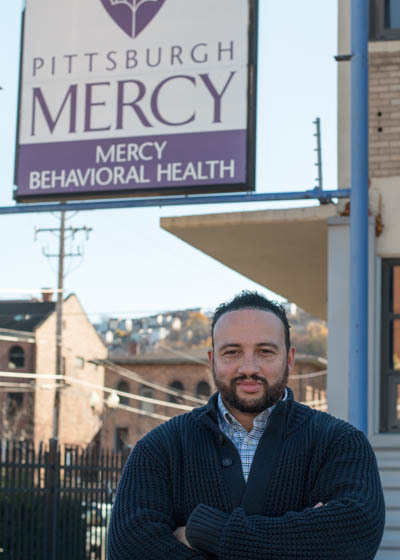 I applied externally; I have always been drawn to Pittsburgh Mercy due to its faith-based mission and its stance as an excellent provider of community-based mental health care. They have been one of the main employers I've been seeking to work for since completing graduate school. What are your key responsibilities in this new role? I manage an outpatient unit, which includes oversight of all administrative functions, the hiring of staff, provision of individual supervision, program development, oversight of treatment initiatives and ensuring best practices are followed. I also maintain relationships with all community stakeholders - external providers, government entities and review referrals - to ensure regulations are followed. Additionally, I run group therapy sessions. How have your degrees from Point Park helped you in your career? My undergraduate degree in English has allowed my business communications to flourish and given me an edge in writing reports and medical records. It has also helped me stay cognizant of cultural inclusion and different humanistic angles to approach my tasks with on a daily basis. My graduate degree in criminal justice administration has helped me understand human services administration and study in depth about the criminalization of mental illness, which happens a lot due to a myriad of circumstances. Also, I learned about diversion and specialty courts (such as mental health court and veterans court) in the graduate program, which is something I have participated in during my career. Why did you return to Point Park to pursue an M.S. in criminal justice administration? At the time when I was looking at graduate schools, I was a supervisor of a local juvenile behavioral health unit that obtained referrals from juvenile probation units. I felt the public policies being developed for that population, along with my strong desire to continuing managing such a program, would be most supported by obtaining a degree in criminal justice administration. Share with us your favorite memories in the English and criminal justice administration programs. While I was an undergrad, I loved Dr. Newman, Dr. Weston and my work-study supervisor, Dessie Bey. As a graduate student, I enjoyed Dr. Stein and Dr. Fowler. Both had a high standard of academic integrity and really instilled in students a sense of discipline. Also, I enjoyed being able to incorporate my academic studies in the criminal justice administration program into many aspects of my work. I'm very happy. I'm in a great organization and in a role that really married my M.S. studies with my work. I consider any growth from this point forward to be an added bonus! I would love to be able to steer public policy on some level that impacts the criminal justice system and its interaction with the mental health system. If you truly hone in on what you are doing for a living, then you will become more aware of if you are doing your job well or not. As you continue down your career path for the long haul, continue to ask yourself if it's a fulfilling, altruistic and honest profession. Is it something to get paid for and be happy about? If you find yourself answering "yes" to these questions, then adding education to your life can only lead to a better outcome.